A Video by Frans Lanting. A short video presentation on his Life Project, and how the ‘biodiversity project’ for National Geographic led him there. Quite possibly the only photography related “news” you need to give your attention to. Amazing. Animal Photos of the Year. The UK’s “The Telegraph” present 30 Photos of the year, in the category “Feeding and fighting”. The first image is fantastic. Check all the categories for some more cool photos. Photos of the Year. Naturescapes.net presents their Photos of the Year Gallery. Some amazing images here, all of them. Justin Reznick’s Grand Teton image is superb. Congrats to everyone. Quote #1: “Human salvation lies in the hands of the creatively maladjusted.” – Martin Luther King Jr.
ANWR turns 50 Years old. And I’ll plug my own slideshow here. If you haven’t seen it, take a wander through the Arctic National Wildlife Refuge with this birthday tribute; 50 years since the establishment of the Refuge. Here’s to the next 50. Photographers present their 2011 favorites. Jim Goldstein hosts the annual photo-pallooza, with well over hundred and fifty photographers offering their favorite images from the last year. Thanks to Jim for putting this together. Check out the work here. Photography and Conservation. A video from the ILCIP, International League of Conservation Photographers. “In a new video documentary, some of the world’s foremost conservation photographers discuss the critical role photography plays in calling attention to threats faced by the natural world and in affecting global change.” Watch the Video documentary. “You really can’t have successful conservation without photography shining a light on it”. Photography Business Plan. A helpful article on mapping out where you might want to head, starting now. Contrast this structured approach to the typical “let’s see what happens when we press this” strategy adopted by most “artist” types (yes, yes, yes, I know, gimmea break here, OK?) 🙂 Start Your photo business plan for 2011. Frog and a Snake. Of all the amazing images coming from the countless weather related madness around the world, this one is pretty wild. A frog hitches a ride on a the back of a brown snake to flee the flooding in Queensland, Australia. Photo Editing Tips. Another article via Jim Goldstein’s blog, Experienced professional Gary Crabbe offers his advice on editing photos. A helpful read, well worth your time. Gary’s really someone to learn from, so this article is full of useful tips. Aperture Blog. Aperture users would do well to subscribe to this great blog. With a new look, it’s a great site. Nature’s Best Magazine. 2010 Winners published in Nature’s Best Magazine. Windland Smith Rice International Award Winners. Some wonderful photography here, of course. Look for Bence Máté’s Green-crowned Brilliant Hummingbird and Green Pit Viper – stunning shot. Meditation and the Brain. Not directly “photography” related, but I’m sure the findings would be very similar had they studied making art. “an 8-week meditation course leads to structural changes in the brain”. Short article from Scientific America. We are Cyborgs now. Technology is evolving us, says Amber Case, as we become a screen-staring, button-clicking new version of homo sapiens. Amber Case studies the symbiotic interactions between humans and machines — and considers how our values and culture are being shaped by living lives increasingly mediated by high technology. Good, short presentation. Quote #2: “We don’t like their sound, and guitar music is on the way out.” – Decca Recording Co. rejecting the Beatles, 1962. Science and People. Are we hard-wired to distrust science? “The absence of scientific evidence doesn’t dissuade those who believe childhood vaccines are linked to autism, or those who believe their headaches, dizziness and other symptoms are caused by cellphones and smart meters. And the presence of large amounts of scientific evidence doesn’t convince those who reject the idea that human activities are disrupting the climate.” This is a pretty interesting article, read it here. Facebook Ads are up. Facebook continue to spread the word, and make every single word you utter someone else’s spam. Now they’ve “introduced a new advertising vehicle called Sponsored Stories, which takes all those shared “likes,” check-ins and other actions that are already being posted by you and your friends and turns it into a paid ad.” The folks at Facebook say who tested this out said “it helped with brand identification and retention.” Seems like there’s no end to this stuff. Full article. 2010 Tops off a hot decade. And yet the deniers continue. “Topping off the warmest decade in history, 2010 experienced a global average temperature of 14.63 degrees Celsius (58.3 degrees F), tying 2005 as the hottest year in 131 years of recordkeeping.” From the Earth Policy Institute. Winter on the Kuskulana River, Kuskulana Gorge, near the McCarthy Road, Wrangell – St. Elias National Park and Preserve, Alaska. During the summer this river rages a dirty silty brown, a seething torrent of dirty water. 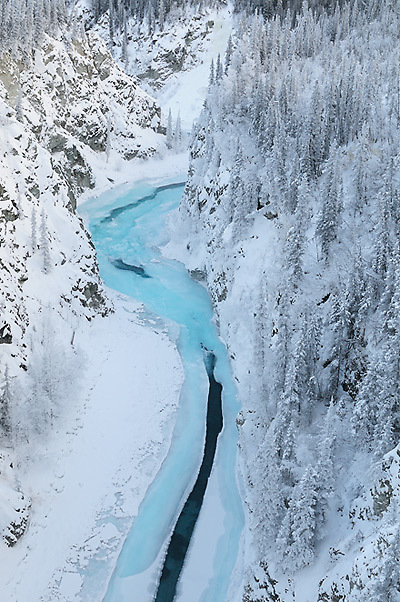 At the lower water levels of winter, it becomes a beautiful turquoise. Fantastic place. Wilderness Debate. Is it jobs versus preservation, of jobs versus jobs? “For years, colleagues in the outdoor industry have recognized the tired, old sound-bite debate of “jobs vs. preservation” as overlooking the 6.5 million Americans whose jobs are created by the active outdoor recreation economy. It is as if the $730 billion contributed to the American economy annually did not exist”. A nice article by Black Diamond Equipment CEO Peter Metcalf. Doug Peacock on Grizzlies. In an interview with Yale Environment 360, “Peacock talks about why the demise of white-bark pine will lead to more contacts between grizzlies and people, why the grizzly needs to be protected under the Endangered Species Act, and how witnessing the bear in the wild helped restore his spirit after his tour as a Green Beret medic in Vietnam”. Doug Peacock’s awesome. Check this interview out. Durrell’s vontsira (Salanoia durrelli) Welcome to the world. Scientists “discover” the Newest Member of the Order Carnivora in 24 years. A mongoose-like creature in Madagascar. Of course “the creature may not be long for this world: much of its wetland habitat has been drained to grow rice”. The World’s Newest Cat. Scientists have determined that the Clouded Leopard actually exists in 2 distinct forms, or species. “This big cat is so enigmatic that researchers only realised it was a new species – distinct from clouded leopards living elsewhere in Asia – in 2007. The first footage of the cat in the wild to made public was only released last year”. Pretty cool article here, with a video. Polar Bear’s Epic swim. “A polar bear swam continuously for over nine days, covering 687km (426 miles), a new study has revealed … researchers say that increased sea ice melts push polar bears to swim greater distances, risking their own health and future generations. …. “This bear swam continuously for 232 hours and 687 km and through waters that were 2-6 degrees C,” says research zoologist George M. Durner. High school biology teachers and evolution. This is disturbing. “The central theory of biology is evolution, yet a new study shows that most high school biology teachers are reluctant to endorse it in class. .. about 60 percent, “fail to explain the nature of scientific inquiry, undermine the authority of established experts, and legitimize creationist arguments.” I wonder if math teachers resist teaching pythagorean theory? This entry was posted in Alaska, Environmental Issues, News, Photo business, Photography, Social Media, Stuff to Click On, Winter, Wrangell - St. Elias National Park and tagged conservation, environment, News, Photography on February 2, 2011 by Carl D.
Always leave here feeling a bit more educated than when I arrived Carl. Good stuff man. Particularly enjoyed the grizzly article, worrisome actually. In fact, many of these were quite disturbing.. the evolution teaching, the smart meter fear… One has to think that the amygdala ticklers in the media that many in this country rely upon for their information is responsible in part or in whole. You would think if we were cyborgs people could filter some of this stuff like a virus scanner. But then again, maybe it proves the cyborg point. We are only the products of our programmers. Thanks for the follow up. I’m glad the info here is appreciated. I agree .. we’re almost totally products of our programming. You are what you eat, eh?